Well, I goofed. I had this post all set to go in May and never hit "Publish"! So here's a little springtime for you, now that the Northern Hemisphere is plunging toward winter. Enjoy. 'Tis shearing season again--yippee, yahooie! While I respect the option of not getting excited by this news, I can't say I'll ever understand it. The multi-sensory pleasures of sheep, goat, llama, rabbit and alpaca coats (especially once the animals have given them up) utterly make me swoon. And I am not alone. Remember my friend Kristen who won the Goat Giveaway? 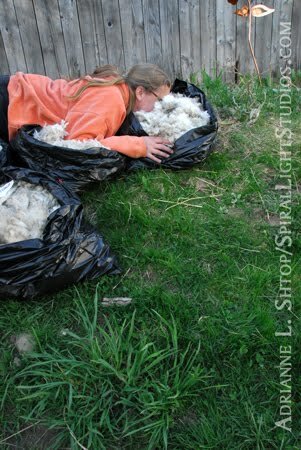 Well, last weekend her goats had their first shearing since they've been in Vermont and I was on hand to photograph the momentous occasion. 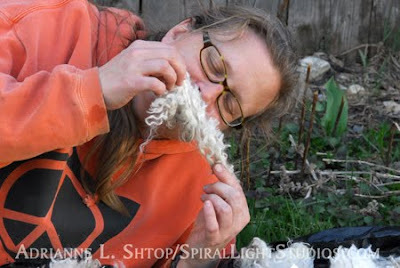 You can view a bunch of the more downright upright photos on Kristen's blog, Gilead Goats. I, however, am about to reveal the dark underbelly of fiber fanaticism. I wish I could say we spent the entire weekend huffing mohair, but there was a lot of hard work involved too. After trimming her goats' hooves, applying insecticide, and moving them to a new pasture, Kristen received her first shearing lessons from the kind neighbor who had sheared her goats. 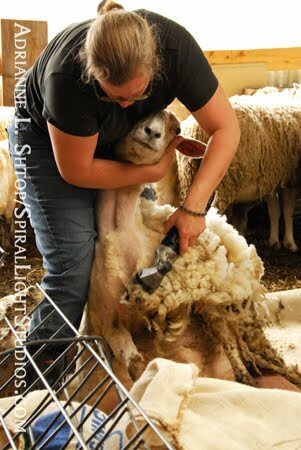 As a former small animal veterinary technician, I understand the challenge of convincing creatures to let you do strange things to them with electric equipment. The thrills and perils are multiplied when the animal weighs 175 pounds, but Kristen was awesome and threw herself right into it. I will leave you with this image of head down into happiness. Some of you are very jealous right now. You know who you are. Fantastic post Adrianne! You've really captured the spirit of that day so much better than I ever could have. Miss you madly!